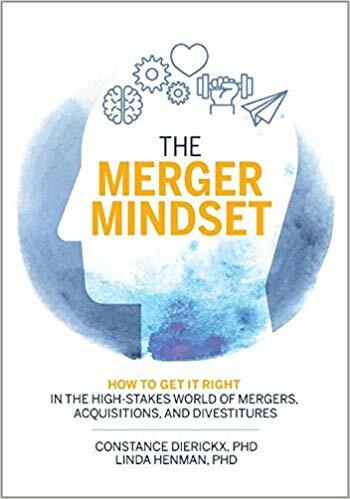 The Merger Mindset offers a unique perspective for leaders―those executives whose companies, reputations, and futures will thrive or fail because of a deal or a series of deals. This book for leaders helps decision-makers deal with the powerful undercurrents and interpersonal dynamics at play in every deal, and no one is more qualified to write it than Constance Dierickx and Linda Henman. Other books on mergers, acquisitions, and divestitures overwhelmingly have one characteristic in common: they’re technical. Attorneys write books about the legal and contractual aspects of deals; project management experts write from the point of view of managing tasks and schedules; and investment bankers write about valuation and negotiation. The Merger Mindset presents an amalgamation of what Drs. Dierickx and Henman have observed―and in many cases, helped to create―in more than 65 cumulative years of consulting with Fortune 500 companies, privately-held firms, family-owned businesses, and military organizations. Their in-the-trenches experiences spurred them to arrive at this premise: To position their organizations for more success, leaders can’t shy away from the high stakes, tough decisions about their futures. This book maps the key steps in the M & A journey. It takes the reader through how to make the decision to grow acquisitively, identify roadblocks and typical wrong turns, and ultimately shows how to unlock their decision-making potential while navigating an increasingly uncertain world. Through compelling stories and surprising research findings, readers will discover that there’s much more to the decision-making that drives M & A deals than they ever imagined, and they will come away with tools to help them deepen their understanding of what it takes to succeed. A fascinating read, the text weaves lessons that surface from the stories with highly pragmatic advice about suggested mindset, checklists, processes, and diagnostic tools. Readers will understand that while M & A deals aren’t simple, leaders don’t have to overly complicate them either. Instead, they can simplify the process if they remember hope shouldn’t serve as a strategy, and they can’t abdicate or delegate their leadership responsibilities. The lessons from mergers and acquisitions are critical to those considering a deal, but applied elsewhere, they have equal value, even though noticing them takes more effort. This is the essence of leadership: doing the hard work of ensuring that the gulf between strategy and tactics does not lead to either over simplification or needless complexity.